Serving our industry since 1944, Houle has played a key role in the construction and renovation of numerous BC landmarks and major institutions. Meeting every kind of project head on from bridges, ports and pulp mills, to hospitals, schools and shopping malls, Houle has overcome many unique challenges through innovation and the expertise knowledge of our long standing workforce. 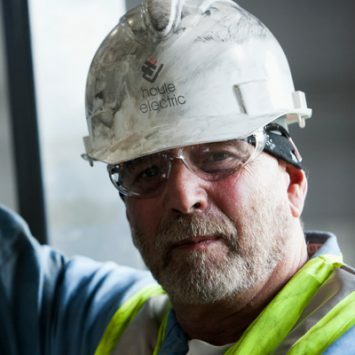 We pride ourselves on professional electrical construction, design-build services and excellence in project management. 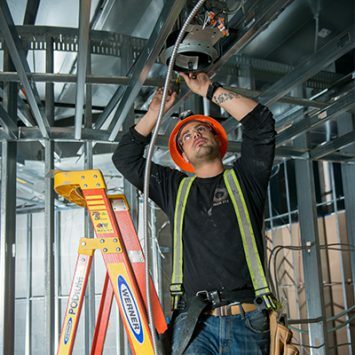 Get more information about Electrical Construction. Our in-depth knowledge of today’s complex and high-tech industrial projects, combined with our expertise and large workforce, enables us to meet requirements of any scale. From meeting or exceeding demanding completion schedules to working in challenging, remote environments, Houle’s ability to skillfully coordinate people, tools, and equipment combined with the ability to constantly adapt, results in the successful completion of projects. Get more information about Specialized Industrial. 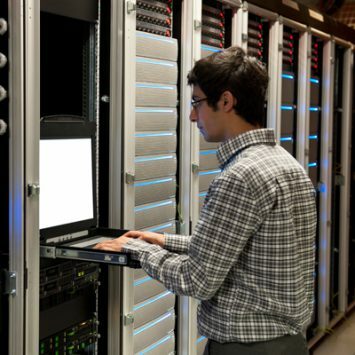 From full server rooms to multiple site roll-outs to large construction based projects, Houle’s Network Systems team can serve all your needs. 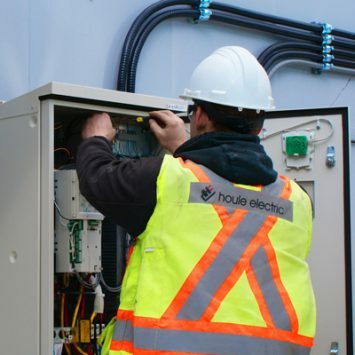 Houle’s Network Systems Group serves a variety of specialized markets including telecom providers; healthcare and hospitals; office buildings; industrial sites; school districts and educational institutions; municipal, provincial, and federal governments; manufacturing and wholesale; financial institutions; and retail stores. Get more information about Networks & Infrastructure. Houle is dedicated to providing solutions that can fully integrate all security operations. Our in-depth relationships with all the leading product manufacturers and dealers mean that we always present you the latest technology offerings. 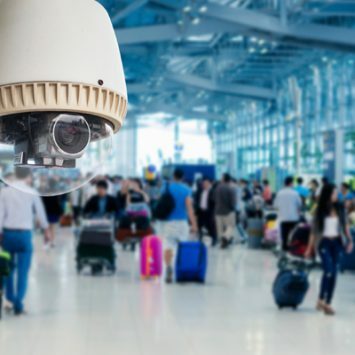 In addition to serving you at every phase in the life cycle of your security needs, Houle provides full service support and integration to every other area of your operation that involves security. This includes data networks, automated building controls, lighting systems, and more. Get more information about Security & Life Safety. Houle’s Building Automation team provides customers with modern building control systems for HVAC, lighting control, and energy monitoring, as well as system integration management and process controls applications. We provide a mobile service fleet, as well as remote diagnostics over modem, Wi-Fi, or the Web for immediate, around-the-clock service. Through our custom Web development capabilities, customers can also utilize remote notification, viewing, and control across multiple buildings. Get more information about Building Controls Automation. Our Power Quality team can help you mitigate risks and extend the life of your electrical systems while decreasing risk of property damage and increasing life safety. Through our leading edge solutions and asset management tools, we perform electrical inspections, reporting, and documentation. 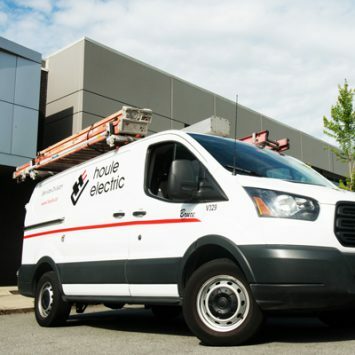 From performing regular preventative maintenance to protect your equipment from sudden power outages to helping you reduce your energy footprint through LED lighting initiatives, Houle is dedicated to protecting your business and its operations. Get more information about Power Quality. 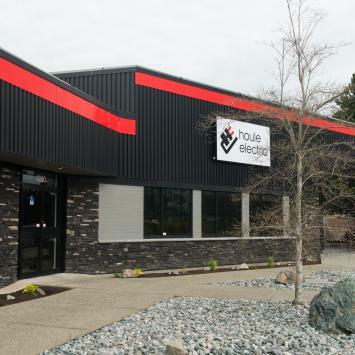 Houle’s Service Department is dedicated to meeting the needs of our industrial, residential, institutional, and commercial customers throughout British Columbia. Our team of highly trained certified technicians is renowned for quality of workmanship and industry leading safety practices. With our 24 hour emergency service combined with work that is 100% insured, you can rest assured that your service needs are looked after. Get more information about Service. Houle’s trained and accredited AV systems specialists are available to assist you with AV design, installation, and integration. We deliver simple updates and retrofits to complex turnkey AV systems. 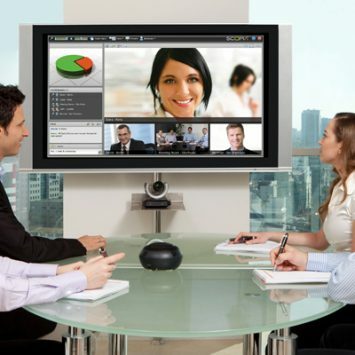 Our team has expertise in video conferencing, touch screen control systems, video projection, sound systems, digital signage, video walls, and sound masking. We can furnish, design, and install light and shade control systems. Get more information about AV Systems. 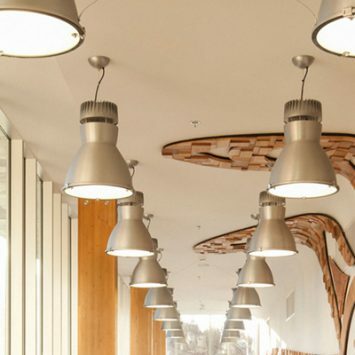 Houle offers in-house design, consultation, installation, and maintenance services for lighting. Our focus on energy saving solutions means that you can lower your electricity bills while reducing your carbon footprint. 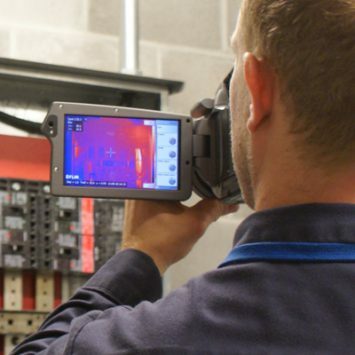 We can conduct energy savings analysis of your current lighting systems, with calculations of the proposed savings and payback if new energy saving technology products are installed. Get more information about Lighting. 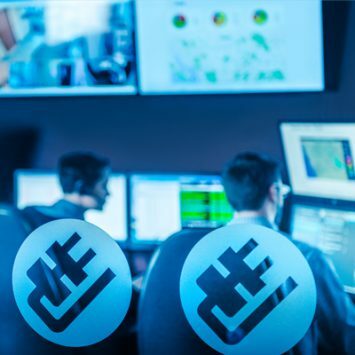 The Houle Operations Centre (HOC) is a state-of-the-art facility in British Columbia that manages the electrical, control, data network, and security systems for our customers’ facilities. We are your 24 hours a day, 7 days a week answering, dispatching, and monitoring provider. We also deliver the best in video monitoring solutions to meet your facility’s security needs. Get more information about Operations Centre. As your single source for maintenance, repairs, and monitoring, our facilities maintenance team ensures your facility is running reliably and efficiently. 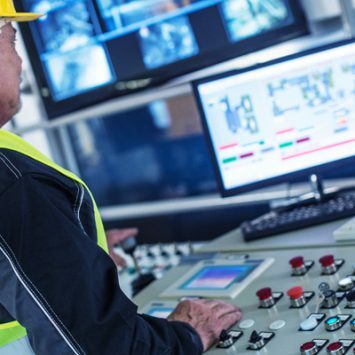 Our team can help you extend the life span of your systems and building life cycles while reducing downtime to your operations. Get more information about Facilities Maintenance.